Thunderstorms that ripped through greater Washington, D.C. Tuesday night damaged homes, snarled traffic and led to one driver's death. Police say 79-year-old Elmer Henry Froelich was driving eastbound on Darnestown Road in Poolesville, Maryland when he struck a tree that fell across the road. The one-car collision occurred at Darnestown Road and Cattail Road and shut down the area, Montgomery County Police said. Froelich was pronounced dead at the scene. Tornado Touched Down in Frederick Co. Sat. Howling winds toppled a tree onto a home in Fairfax, ripping a hole through the roof right above a bedroom. "My son was supposed to be sleeping, and I happened to pull him out of bed to get something from Home Depot," resident Raghda Chikalard said. "Thank God everybody's safe." The family's car was also damaged in the storm. 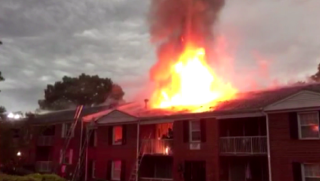 Lightning hit an apartment building in Greenbelt, Maryland, sparking a fire that displaced residents of 22 apartments. The blaze erupted on the 200 block of Lakeside Drive. No one was injured, a Prince George's County Fire and E.M.S. spokesman said. Residents from 22 apartments were displaced by the fire in Greenbelt. Another apartment building was hit by lightning in Arlington, Virginia, according to the Arlington County Fire Department. No one was injured in the fire that erupted on the 1600 block of 21st Road. And drivers headed northbound on George Washington Parkway were thwarted by a tree that fell across the road. The tree fell near Route 123 southbound, causing U.S. Park Police to send drivers back southbound. Flash flood warnings and severe thunderstorm warnings were in effect until 10:30 p.m. for most of the region. The heavy rain and strong winds left tens of thousands of people in the dark -- as well as a popular mall in Pentagon City. The flash flood warning was in effect through 11 p.m. for the District, Montgomery and Howard counties, and parts of Anne Arundel and Prince George's counties. The severe thunderstorm warning was extended until 10 p.m. for southeastern Prince George's County, as well as Calvert, Charles and St. Mary's counties in Maryland. The storm was capable of producing quarter-sized hail and damaging winds in excess of 60 mph, according to the National Weather Service (NWS). All current storm alerts can be viewed here. The storms rolled into the area from the west late Tuesday afternoon, with heavy rain -- torrential, at times -- arriving on the heels of the day's extreme heat, which reached dangerous levels. At the height of the storms, flights headed to all three D.C.-area airports were ordered held at their points of origin. The ground stop ended, but delays persisted as of 8:45 p.m. Amtrak service between D.C. and Philadelphia was suspended for several hours before being restored about 8:30 p.m.
Power outages are spread across the region, with tens of thousands of residents left in the dark. The outages included about 13,000 Pepco customers as of 8 p.m.; more than 10,000 of those are in Montgomery County, with the remainder in D.C. and Prince George's County. Dominion Virginia was reporting more than 28,000 without power in Northern Virginia around the same time. BG&E also had more than 28,000 outages, including 1,500 in Prince George's County. A power outage was also reported at the Fashion Centre at Pentagon City in Arlington, Virginia. A downed tree led to the closure of most lanes of Braddock Road at Chandley Farms Circle. One lane was open, Fairfax County authorities said around 7:45 p.m. In the hours before the storms hit, temperatures had soared into the mid to upper 90s, with the heat index exceeding 100 degrees across the region. A heat advisory for the D.C. area expired at 7 p.m.